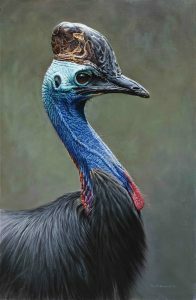 The grand-nephew of Sidney Nolan, Tony’s talent was evident from an early age when, aged 19, he won ‘Best in Exhibition’ at the prestigious Wildlife Art Society of Australia awards. A keen and knowledgeable naturalist, Tony travels widely searching for new ideas and challenges. His field research has taken him to many parts of the world but his passion is for the Australian bush, its wonderful light and its diverse fauna and flora. Tony has a deep knowledge of the birds and animals he paints. 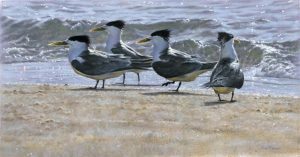 Whatsets his work apart is that he studies the birds he paints in their natural environment, so he can capture the unique attitude and movement of each species. 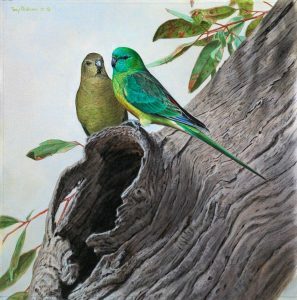 Tony’s art has been published in a number of science-based natural history books. Most notable is his award-winning publications: Grassfinches in Australia(2012) and Glimpses of Paradise (2008). Both books received Whitley awards for excellence in zoological illustration. A further book, The Night Parrot: Australia’s Most Elusive Bird (2018) is soon to be published. 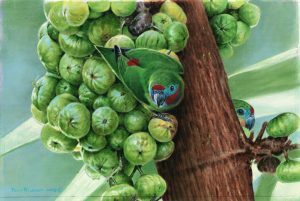 Birds in Art is the world’s most important and prestigious exhibition of bird art. It is held annually at the Leigh YawkeyWoodson Museum in Wasau, Wisconsin, USA. On average 800 entries are received, of which only 80 are selected for showing. Tony has been a finalist six times. His work is represented in e three foremost American galleries specialising to wildlife art: Hirum Blauvelt Art Museum (New Jersey), Leigh YawkeyWoodson Art Museum (Wisconsin) and the Bennington Art Museum (Vermont). Originals are also held by the Australian Racing Museum (Melbourne) and featured in many private collections across Australia.